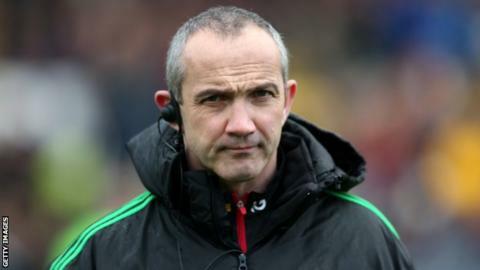 Harlequins director of rugby Conor O'Shea will leave The Stoop when his contract expires at the end of the season after six years in charge. The 45-year-old, who led Quins to the Premiership title in 2012, has been linked with the Italy head coach job. The club, which also won the Amlin Challenge Cup and the LV Cup under O'Shea, says it is searching for the Irishman's replacement. "The end of this season is the right time for me to move on," said O'Shea. "We have a very talented group of players and coaches who are intent on securing silverware this season. "That is my sole focus and where all our efforts are concentrated." O'Shea won 35 Ireland caps between 1993 and 2000, spending 10 years at London Irish as a player and coach before taking over at Quins. He took the job in the aftermath of the 'Bloodgate' scandal that ended with Dean Richards resigning. "All of us at the club are of course disappointed that Conor will be leaving us at the end of this season," said Harlequins chief executive David Ellis. "Conor took over after a difficult period in our history. "Under his leadership and through his determination, energy and positive approach he has helped restore pride in our famous shirt and rejuvenate the playing style for which we are known. "On behalf of all of us associated with Harlequins, I would like to thank Conor for his tireless and selfless commitment over the last six years, guiding us through our most successful period on the field. "Conor will leave the club in a significantly better place than he found us and for that we are all grateful to him." Quins are third in the Premiership table, six points behind leaders Saracens. "O'Shea has done a magnificent job at Harlequins, dragging the club from the low of the 'Bloodgate' saga and turning them into Premiership champions in 2012. "Under his tutelage Quins have also provided a host of England internationals, and at one point fielded a whole XV of England-qualified players. "With his contract up at the end of the season, O'Shea clearly feels ready for a new challenge, and has had discussions about replacing Jacques Brunel as Italy's head coach. "As for his successor, the former England boss Stuart Lancaster could possibly fit the bill as a like-for-like replacement."